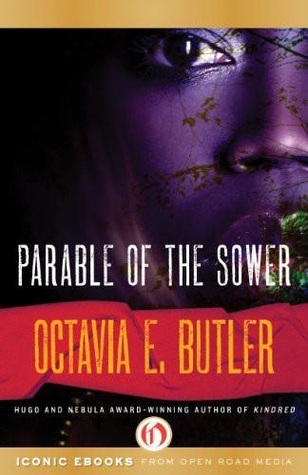 I chose Parable of the Sower for my book club before I’d read it myself, because I thought it was about time we read something that wasn’t written by a white person. This had been on my to-read list for quite a while and it sounded weighty and realistic enough for a good discussion. I agree with my mom, who told me when she finished it that the story feels unfinished. This is really just the beginning. And as it turns out, the author, Octavia Butler, died before she had a chance to finish the series. But there is a second book that I’m told makes the story feel more complete. Reading this book was a little bit like watching The Walking Dead . It’s a group of strangers being drawn together somewhat reluctantly by the will to survive in an extremely hostile future America. Their leader is Lauren Olamina, a young black woman. That in and of itself makes it a good story. Refreshing, to say the least. And I love Lauren’s hyperempathy, or “sharing” as she calls it. She literally feels other people’s pain. I love that concept, and it’s especially interesting in this world where hurting other people is often necessary for survival. One of the most interesting aspects of Lauren’s strength, to me, is her sexuality. It’s not a major aspect of the book, nor should it be. She’s attracted to men and she has relationships with them, but they are not the center of her universe. Lauren isn’t confused or upset or rendered in any way weaker by her sexuality. She just buys condoms when she needs to. She understands and accepts that aspect of herself, and she prepares for it. She has more important things to worry about. I was so grateful to see that an author finally got a woman’s sexuality right. Thank you, Octavia Butler. Beyond Lauren, though, I wasn’t able to connect to this book very much. I like Lauren’s ideas about spirituality and survival and hope. But the story of her group’s journey to Acorn is just dark and gruesome, with new horrors emerging throughout. I’m not a fan of stories like that. I stopped watching The Walking Dead after about a season and a half (although that was partly because I got tired of all the impassioned speeches). I think the major thing that bothered me about this book was that it didn’t even attempt to explain how things got so terrible, with drugs and murder running rampant in an America where the government does nothing and the cops are corrupt. It’s hard to believe that our country could ever get so bad. But I’m sheltered and I take my safety for granted, I suppose. Plenty of people in this world are living a nightmare. It could happen here, too. I like books that make me feel good. Lauren really is an interesting character. She’s not super-likable since she’s so strong and not very relatable. Her physical empathy is her only weakness. But it’s awesome to imagine that a woman could have so much strength and hope—could so firmly believe that she has the power to push back against horrific circumstances—in a world that is out to get her at every moment. And it’s interesting to consider what this book is saying about the current state of our world. We’re abusing our natural resources. We’re not solving race issues. Our authorities don’t always have our best interest in mind. Slavery still exists. We aren’t really handling the drug problem. We may be first world, but our problems are serious. The thing is, human life as a whole is getting better. It might not seem like it, but it’s true. And things might collapse before they get even better than this, but I think they will. I believe as Lauren does that humanity will keep springing up anew for many many years to come, especially if people hold onto hope and believe in themselves. New worlds are possible, and our will to survive runs deep. Humanity’s worst enemy is itself. Isn’t that strange? We’re so intelligent and yet so irrational. There are no monsters in this book. There’s no bad guy. And yet every person in it is a potential monster or bad guy. It’s too realistic for comfort. See all my book reviews on Goodreads.